Subtlety isn't on the agenda for Razer. The Megalodon headset is supplied in a black and green box, packed in a ludicrously large foam-padded case. 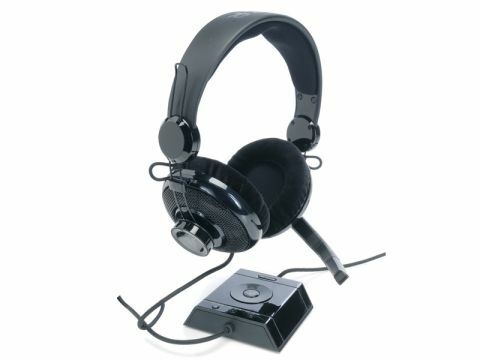 It connects to your PC via a USB box that lights up like a control room at NASA, and even the Razer logos on the headphones feature LEDs. With their grilled cups and loose cables, the Megalodon headphones sport something of a 1970s hi-fi look, which wouldn't be so bad if closer inspection didn't reveal that they're made mostly of plastic. The advantage is that they're slightly lighter and more comfortable than their counterparts, but they do feel a bit tacky - especially given the £120 price tag. All adjustments are carried out in the USB control panel, which saves fiddling with software when you're halfway through a game or movie. Despite its sci-fi looks, the headset does a good job of managing multiple controls like volume, microphone sensitivity and bass levels via a single jog wheel. A button at the top of the control panel activates Maelstrom mode, which Razer reckons upmixes sound to 7.1 surround. According to the packaging, it does this with a mixture of 'Interaural Time Difference' and 'Simulated Ear Refraction'. According to our ears, it just doesn't work. The result seems to be a general muddying of all sound channels. Matters are made worse by the fact that you can adjust each of the eight virtual speakers individually, giving you a really good idea of how indistinct each one sounds. The 'rear' simulated speakers, for instance, just sound like the 'front' ones, only fuzzier. They work just fine in 2.0 mode, though, delivering crisp, punchy sound, and the noise-cancelling mic is a boon for chatty gamers. But Razer is selling them on the basis of the 7.1 surround sound, and this is next to useless.